Ed Quarters Welcome to March's issue of the magazine. Despite the weather at the start of March, it really feels like the season has finally began. By the time you read this, this year’s mileage program would have started. I’m hoping by the time the ride to Sammy Miller’s comes around that my gloves will be sufficient for the ride down there. FaceBook reminded me that Ann and I picked up our current rides two years ago on the 2nd March. The hailstorm we rode home in was not quite as bad as the “Beast from the East”, but nasty enough. We have already booked this year’s small but beautifully formed mini tour. This year we’re heading south-west and taking in the sites of Dartmoor, Exmoor and beyond. Really looking forward to it. By that time, the mods to my bike should have been well and truly bedded in, and the ride more familiar. Winter for me is trouble. It’s the time when I get to thinking about this year’s mod and it usually costs me a pretty penny. My homage to the 70’s chop that made me fall in love with Harleys is gradually coming together. It will however take any more years to nail it. This magazine has been made possible by the support and contributions from the members of this great Chapter. If you have anything that you would like to contribute, it is most welcome. If you would like to find out more about what goes into putting this magazine together, just ask. I am more than happy to answer any questions that you may have. Okay. Let’s get out there and ride. We would like to welcome, new member Adam Anderson to the Chapter. Happy Birthday to you all. If I've missed you or got something wrong, drop the Editor a quick note. Hi all, OK, so wishing for better weather is clearly not working … at the time of writing this article, we have experienced an extremely cold spell, with snow for most, icy mornings and the coldest of winds rolling in from Siberia. So … no more wishing… a few of you folks have been able to sneak out between the storms, well done if have been able to take advantage of these short windows of opportunity! Your committee is now working flat out to bring you some of the best fun in the riding scene. We have a number of weekends booked and underway, including the final plans for our 2018 Convergence Rally which is a really exciting one. I visited the site a few weeks ago and can confirm that this year is going to be a really good one for this rally. Not unlike the bigger rallies, the site has a lot of onsite accommodation as well as camping and caravan facilities. With meals included (breakfast and dinner on two days) the ticket price offers great value. Plans for the Valley Rally are moving along. The guys and gals in that subcommittee are trying to tie up final arrangements and we are now well over 100 tickets sold. We will be welcoming groups from near and far including a group from Oxford and a contingent from Belgium. Our deal on hotel rooms will expire at the end of March and after that, rooms will revert to normal pricing and availability. Right now, you can get room at a special price of £55 per night. To take advantage of the offer you must call the hotel direct on 01494 680929 and ask for Kishor. Let him know you are booking for the Rally on the special rate and he will book you in. If you get the auto-director answer system please choose the hotel reception option (usually option 3) because if you choose other options your call will go to a call centre and they will not be able to associate your booking with the offer. HOG UK and Ireland are still working on the announcement about the winner of top male mileage for the 2017 Chapter Challenge. As soon as I have it I will let you know. Since our last Clubnight we have had a few changes to committee which you will see represented on the back page. In anticipation of questions, it is important to know that priorities for our volunteers can change without warning and for some, these changes can make it difficult for individuals to meet their committee responsibilities. As always, all of our volunteers past work is very much appreciated. So..., onto our most recent events and those coming up. Another Saturday Social I was well attended in February. We are starting to need bigger venues! Sadly, I was committed elsewhere on that day and so I was not able to join you. It’s probably not a bad thing as I heard that you needed the space..., hehe. The Cricketers is always a popular venue and for this event, it was certainly cosy! Were you able to get along to the Reading HD Bike Build Off? If not, you missed a great day at the Dealership. The three Reading HD employee teams had obviously all taken the challenge very seriously and delivered three cracking custom Sportsters “ready for sale”. The three bikes were all excellent entries with some great thinking and nice execution to deliver a feast for the eyes. Team Sami and their bike “Warhawk” were selected by the onsite judges for special recognition as the winning bike on the day but all three bikes were worthy of recognition in their own way. The Dealership are also offering a prize to the bike which sells first ... and true to form, Sami closed a deal on her bike within the hour! A special “Well done” to Sami, Greg and Richard on the win and congratulations to Leiber, Jason and the parts team and engineers for their superb efforts. If you missed the chapter mileage challenge event at Reading HD on the 10th March, you can still register for the year. Either take your bike into the dealership to have the mileage recorded or send a photo of your odometer and VIN to our Head Road Captain on hrc@thamesvalleyhog.org.uk. but if you fancy a run out to Whiteways Cafe, come along and support Mark. For the first time in many years we will be putting on a ride on Easter Monday. A ride to the Crofton Beam Engine and Steam Rally has been arranged by Don Wibberley. It’s not a long ride but having visited the site before, it’s a fun day out if the weather holds. Our first Poker Run for 2018 is scheduled for Wednesday 4th April at The Dukes Head in Farnham Royal from 6:30pm and The Jake Spicer Toy Run will be on Sunday 8th April. We are still looking for volunteers to help block at junctions so if you are Roadcrew or an experienced rider and you think you could help please let Jamie, myself or John Green know. Details will be posted on the calendar as soon as we have them. The activities team have also put together a Beer and Skittles evening on Saturday 14th April at the Greyhound in Eton Wick. With hot and cold buffet at £15 per head, its great value. On Sunday 15th April, Ralph will be leading a ride to the Prescott Hill Climb Event near Cheltenham in Gloucestershire. Our next Club night will be on Thursday 19th April. Wow, what a start to the ride programme! 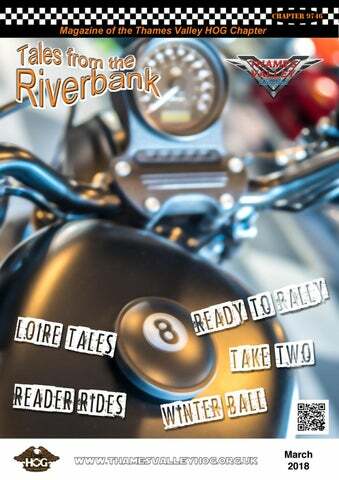 See page 18 for details of the Convergence Rally. Tickets are available now and onsite rooms are limited. The venue is very good this year and both Oxford and Rolling Hills Chapters are joining the rally. All available ticket packages currently offer inclusive hot meals (breakfast and evening meals). Get in early to avoid disappointment. Saturday Socialising. My goodness the Thames Valley Chapter do like their Saturday Socials. Over thirty five Chapter members arrived at the Shire Horse Pub, by bike and by car. The food as ever was enjoyed by all. The penultimate meeting was very good. Afterwards they headed off to the Dealership. Take Two. A few our intrepid members helped out a project that students from Reading University were working on. The subject: Harley Davidson. They wanted find out about our relationships with out bikes. A cold and rather rainy day, but the camera kept rolling. We hope to see the end result in due course. Please check the website for the latest on all rides. Winter Ball Saturday 10th Feb saw a generous handful of TV HOG members toddling off down to Surrey to enjoy the tri-Chapter (Thames Valley, Invicta and Hogsback) Winter Ball, a bit like the tri-wizard tournament, but with less jeopardy! (Nope , I don't know why the Harry Potter reference eitherâ&#x20AC;Ś) The venue was the Reigate Manor Hotel, a pleasant hostelry, with a nice large dining area and dance floor. Andy and I arrived mid afternoon and spent a lazy hour or so watching the rugby before meeting up with everyone else in the lounge area for a drink and chat prior to the main event. Suitably togged up, we then proceeded through to the dining area for a meal of a chickeny something, with roast potatoes and vegetables, and an aubergine and pepper spicy thingy for the hippies. (read vegetarians), followed by a lemon meringue pie. After coffee, the partition wall went back to reveal the band (The Audio Allstars), and with very little encouragement people took to the floor for a boogie. Robbie The DJ took the helm with some real crowd pleasers whenever the band took a breather/ drink break. I have to say this is one of my favourite things about being a Chapter member (apart from great company, and big motor bikes) is people getting up and dancing is a given. The evening wrapped up at between half midnight and 1 a.m. Breakfast in the morning and a sunny drive the long way home rounded of a very pleasant event. 2018 Convergence Rally The Royal Agricultural University, Cheltenham. Friday 10th August to Sunday 12th August 2018 On Saturday 17th Feb, whilst some of you were sunning yourself at the Saturday Social in Littlewick Green, I was at a meeting in Cheltenham with the other Rally leaders looking at the new venue for the Convergence Rally. And what a Bobby Dazzler that turned out to be. The Royal Agricultural University in Cheltenham has huge charisma as a venue, a stunning presence and backed up by some great facilities. The site is dominated by the 19th Century Manor Building and complemented by more modern accommodation blocks on the site. The number of rooms available onsite has been divided equally among the supporting chapters and Thames Valley have 16 ensuite twin rooms and 20 ensuite single rooms available until early April. After this, all unallocated rooms will be pooled for use by any chapter on a first come first served basis. Rally tickets are available now from the activities team and the ticket price includes an evening meal on Friday and Saturday, and hot breakfast on Saturday and Sunday. There will be a mix of disco and live music over the weekend and camping is available onsite. There is a special area for campers and caravans. Tickets start at ÂŁ60 per person, ensuite single rooms are ÂŁ160 and ensuite twins are ÂŁ260. All prices include the rally ticket, rally pack and pin and the meal package mentioned above. Get this one in your calendar! #Hashtag Hello all! Something of a busy month as I've started reviewing our social media footprint and worked with Robin (Chapter webmaster) to tighten-up some of the day-to-day administration of our social media channels. This is to align us better with industry norms and best practices. Many of the changes are behind-the-scenes so are not immediately visible. I'm pleased to say that good progress has been made and by the time the magazine goes to print the main body of work should be completed. Notable Facebook (FB) Changes: We now have a new Ladies of Harley FaceBook group with many members successfully signed-up up already. If you're on FaceBook, a lady member of the Chapter and want to get in on the conversation then head on over to (and click the Join group button): Group Name: Thames Valley Chapter 9746 LoH Group Link: https://www.facebook.com/groups/TVLOH9746/ I've also started to update the main Chapter FaceBook group that is intended for all Thames Valley members on FaceBook. 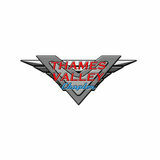 If you're not already a member of the group and want to join-in, then head on over to (and click the Join group button): Grp Name: THAMES VALLEY UK CHAPTER HARLEY OWNERS GROUP 9746 Grp Link: https://www.facebook.com/groups/thamesvalleyhog/ The main Chapter FaceBook page has had a couple of small tweaks. But, the larger changes are yet to come. The plan is that the page will be given over to publish the larger chapter activity and events - especially to encourage nonmembers and members alike. To facilitate this, we will be reducing the list of people that can post directly on the page. This will mean a notable change for some of our longer-term FaceBook users as day-to-day discussion is no longer held via the page. Instead these discussions will be directed to and conducted within the appropriate groups (as noted above). As this is quite a departure we won't be doing this immediately. I'll be posting updates and notifications via the page and other channels leading-up to the change-over so that all members have a chance to join the groups. And, a special mention goes out to Paul Major. We have a 3rd group on FaceBook that was originally created for members to discuss trips and travel to Wales. With Paulâ&#x20AC;&#x2122;s help the admin function has now been transferred. Watch this space as we develop how best to leverage this group going forward. Jamie McLaughlin What Year and model? Road Glide Special 2015 Have You Named your Bike? No - Just called the Harley How Long have you had it? Bought it new from RHD – traded in two bikes. My HD Rocker C and my Yamaha XJR1300. What made you buy it? My Rocker C was a stunner to look with all the chrome and extra bolt on bits, but for me I used to call it my 100 mile each way bike. I could travel 100 miles before I needed to stop for an hour or so due to aching back 'n' bones. Also, passenger seat not very comfortable. So, I wanted to do more away trips with the club and a bigger bike was the way forward. As soon as I rode the Road Glide that was it – Gotta Have it! What Mods has it Got? Full Stage 1 – Air filter – Vance and Hines slip on oval exhausts – Leg protectors –Highway pegs -Tallboy seat –I have a back rest which I don’t use – Docking station - Top pannier from a black Ultra and custom wired in by RHD, Brake light and red indicators. Custom Number plate holder and Number plate & Willie G Timing cover. What Mods do you plan for in the Future? Ape Hangers – Mirrors - Black exhausts down pipes, Extra lights – Front L.E.D indicators black housing – Extra rear L.E.D lights, L.E.D front running lights, better speakers to name a few parts wanted What do you especially like about it? The bike is lovely to ride and the shark nose really like this over the batwing design. Having music while you ride can’t do without it now. Panniers and top box perfect for bunging my junk in –Call it the caravan box. Favourite ride out you’ve had on bike? Hmmm, Hmmmm, Lesley and I went down to Devon one sunny Friday after work. On the A303 we got within one mile of Stonehenge and traffic everywhere (typical Friday night) and the heavens opened up we were drenched. I pulled over by the strawberry seller and hide the best we could under a tree for 20 mins. Only had my water proofs leggings in bike so I stuck them on and off we went. Sun came back out Lesley dried off and I was still damp for rest of the journey. On the way back, a few days later we rode to Weymouth via the Jurassic coastal road, Awesome road. I will plan a ride with this road in the future will be a long ride but worth it- watch this space.